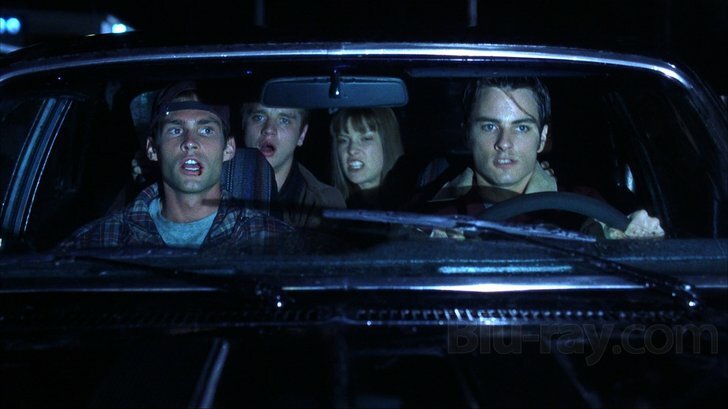 John’s Horror Corner: Final Destination (2000), reflecting on a brilliant movie designed entirely around elaborate death scenes. MY CALL: This film turned death scenes into a celebration of fun jumpy anxiety and it did so with a good story and great intertwined characters. The fact that this death scene-driven horror film relies little on special effects and gore, and more on timing and teasing our nerves, makes it timeless! MORE MOVIES LIKE Final Destination: All the Final Destination sequels except for part 4 (The Final Destination), and the Saw films (2004-2017) if you’re up for much more brutal death scenes. Director James Wong (Final Destination 3) has a knack for cultivating teen drama, immature angst, and amusing ironic tension. From the moment high schooler Alex (Devon Sawa; Idle Hands, The Exorcism of Molly Hartley) boards the plane he notices scratch-like damage at the plane’s door, scuff marks on the wing, and even his food tray has a malfunction. After a terrifying dream of the plane losing cabin pressure and exploding, Alex freaks out and screams that the plane is going to explode, getting himself, several grumpy classmates and one of their teacher chaperones (Kristen Cloke; Black Christmas) forcibly removed from the flight. Naturally, when the plane actually does explode, Alex has to answer a few questions along with his surviving classmates: Billy (Seann William Scott; Road Trip, American Pie), Tod (Chad Donella; Disturbing Behavior, Saw 3D), Carter (Kerr Smith; My Bloody Valentine, The Forsaken), Terry (Amanda Detmer; Drop Dead Gorgeous, Boys and Girls) and Clear (Ali Larter; House on Haunted Hill, Final Destination 2, Resident Evil 3/4/6). So what is it about the Final Destination films that make them work? Sure, building a movie around clever death scenes sounds like a good gimmick, but what multi-victim horror movies aren’t also doing that without relying on it as a premise? The Saw franchise did something similar, but it felt totally different. I’d say the Saw films worked because of excellent writing in terms of story and development, whereas the Final Destination films thrive on how well written the characters are. Their fates are all interconnected so they have more “real” interactions with each other fleshing them out. 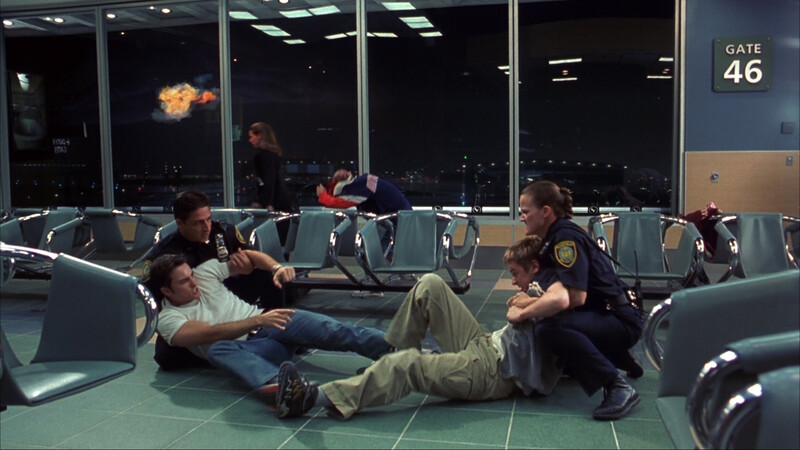 We see this as the students are boarding the plane, after they are ousted from the plane, at the memorial service for the students that were lost… Sean William Scott’s character asking questions about asking a girl out as if Alex was some sort of prophet illustrated a lot about the character. All of the characters are rich, and they become richer as their fear mounts and they learn more about what’s happening to them. Even the FBI agents have their cheeky moment. The bathroom death scene (Chad Donella) was so elaborate, with excellent camerawork zooming in on a leaky toilet valve, the water menacingly and unnaturally creeping closer to the victim as we anticipate a horrible slip while he’s shaving or trimming nose hairs, and then WHAM! A shocking, well-executed death that we didn’t see coming! This first death scene set the standard for the film and taught the audience that we’d endure one red herring after another, and to expect the unexpected in the spirit of fun. Reinforcing these expectations, the city coroner (Tony Todd; Candyman, Night of the Living Dead, Final Destination 1-3/5, Wishmaster, Hatchet II) explains the rules, that Death is indeed coming for them and he will have his due. Tony Todd chews the scenery, but in a most inviting manner for horror fans. Now it’s up to Alex and Clear to try to “beat” Death and save the remaining survivors of Flight 180. This film is good at shocking us in ways that make us jump, and then giggle (assuming you laugh, even if awkwardly, at death scenes). The bus death scene is abrupt, well-timed, and I yelled with a smile at the screen. So now between surprise death scenes and hyper-elaborate schools of red herrings swimming by, we’re paying attention to every prop and moving object on screen searching for the next cause of death. The kitchen death scene presents just such a rollercoaster of anticipation. Now, we know a death is about to happen, and who is going to die. But this spoils nothing. That is the fun of this movie! We see a knife block, a tricky gas burner, leaks near electronics, sharp objects here and there, and that’s just the start to another chain of events in the next big death scene. What other movies ever did this before 2000? Often the Saw films are attributed to the influence of Cube (1997) and Se7en (1995), but I feel that Final Destination deserves a bit of credit as well for bringing a more elaborate art to the death scene. The primary difference is that Final Destination focuses on the actual “chase” of the death scene after its victims whereas Saw focuses on the suffering (and often brutal physical and psychological torturing) of the victim already trapped. The CGI effects may be a bit wonky by current standards, but the imagery is effective nonetheless. On the plane victims are engulfed in fire and jettisoned out of an opening from the explosion, seats and all. However, the bloodwork is solid and there is an outstanding decapitation! But truth be told, this death scene-driven horror film relies little on special effects and gore, and more on timing and teasing our nerves. And for that, this film is timeless. ← John’s Horror Corner: Still/Born (2017), a postpartum horror about a baby-stealing demon.